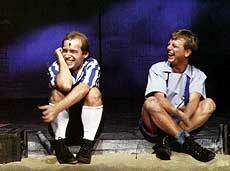 Blood Brothers is one of the longest running musicals in the West End and a massive success all over the world from Broadway to Australia. 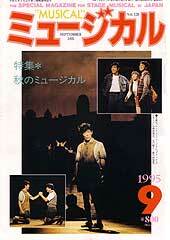 This page celebrates the many different productions during the past twenty five years or so. 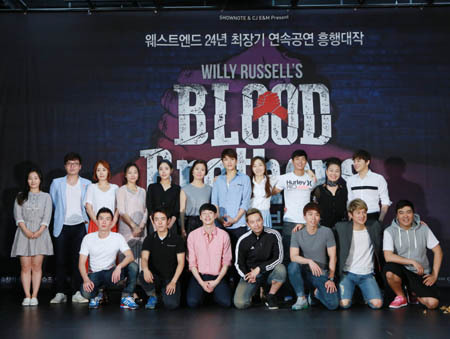 Glen Walford directs a new production of BLOOD BROTHERS in South Korea in the summer of 2014. 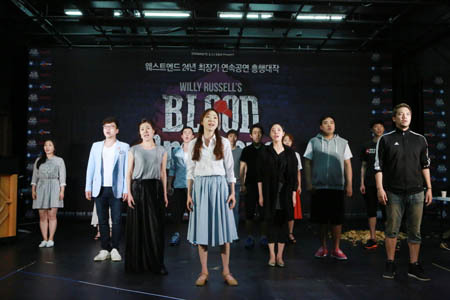 Produced by The Shownote Company, they perform BLOOD BROTHERS at the Hongik Daehangno Art Centre in Seoul and it will run for three months. CLICK HERE to see a slideshow of photographs from the show. 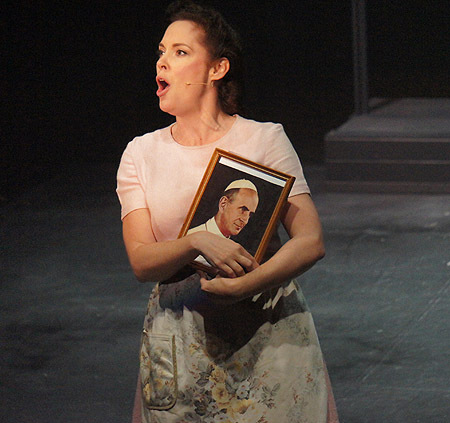 In 2014 Chelsea Plumley played Mrs Johnstone, Gareth Keegan - Mickey and Matthew Bradford - Eddie. 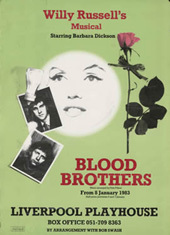 In 2013/14 a production of BLOOD BROTHERS toured South Africa. 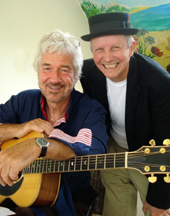 Directed by songwriter, director and playwright DAVID KRAMER. The photograph below show Willy and David running through a few of the musical numbers from the show. 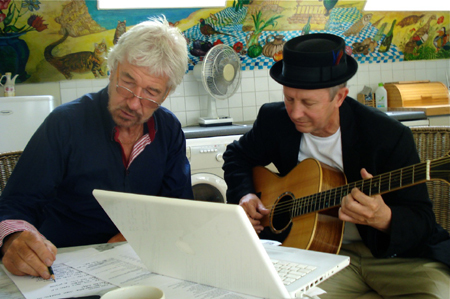 Willy Russell and David Kramer working on the new South African production of BLOOD BROTHERS. 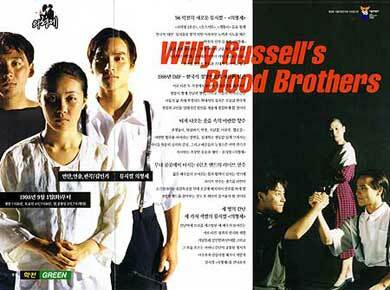 The photograph (very top of page) above shows Glen Walford with some of the Japanese actors who came to the UK to soak up the Liverpool atmosphere before performing Blood Brothers. 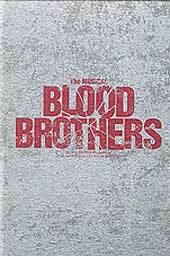 Japan loves Blood Brothers and several productions have taken place in recent years. 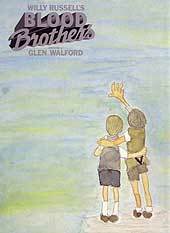 Glen Walford has directed all of these and has a special relationship with Willy Russell's work. 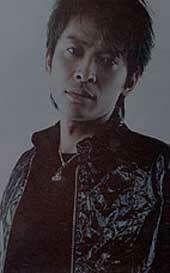 In 2003 she directed a producton for Fuji Television for the Aoyama Theatre, Tokyo and Osaka, Japan. The programme for the show (featured left) is a work of art and measures 14" by 10". Glen Walford's recent work includes a production for Toho Company which opened at Theatre Creation, Tokyo on August 8th 2009. 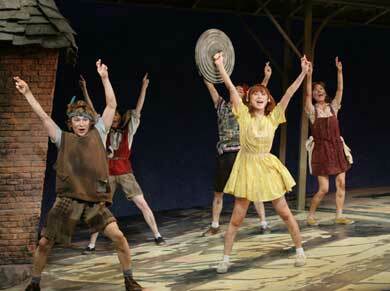 The production will tour Japan in April and May of 2010. 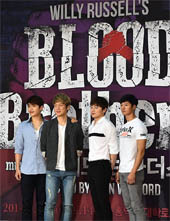 Click the photograph below for a slideshow of the cast. 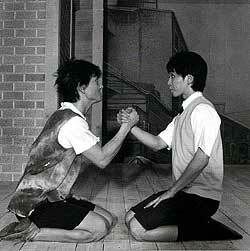 Photographs kindly provided by Masako Tomita of the Toho Theatre. 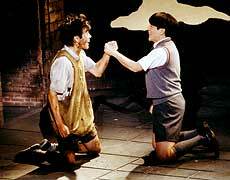 Takeda Shinji and Fujioka Masaaki played Mickey and Okada Kohki Tashiro Mario playes Eddie. 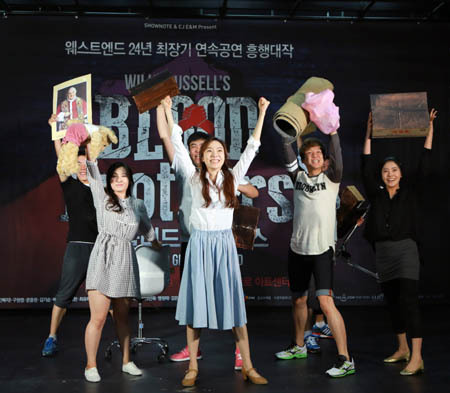 The production also had two Mrs. Johnstones, Kim Ji Hyun and T’sukas. 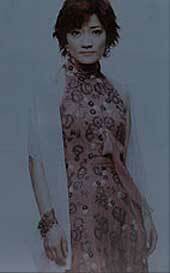 Lisbeth Gajhede played Mrs Johnstone and Allan Klie Mickey with Morten Staugaard as Eddie. 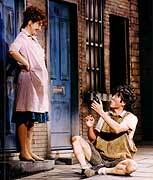 A production toured between 1998 and 1999. The cast included Danny de Munk as Mickey and Frank Rigter as Eddie. 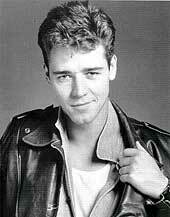 Russell Crowe played Mickey in 1988/89. 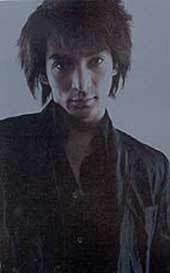 Peter Cousens played Eddie and Christina Amphlett, rock singer turned actress, played Mrs Johnstone. The 1993/94 production featuring Dusan Cinkota, Maros Kramar & Robert Roth as Mickey. 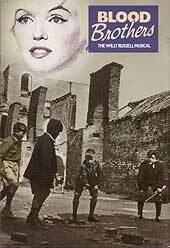 Eddie was played at various times by Jan Gallovic and Stano Kral and Mrs Johnstone by Eva Pavlikova, Zdena Studenkova and Sona Valentova. 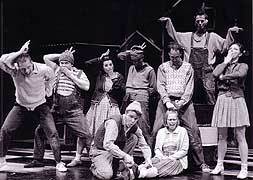 1996 Red Torch Theatre Novosibersk Siberia Russia - directed by Glen Walford.